Twitter's OAuthpocalypse Today - Upgrade Your Gwibber! 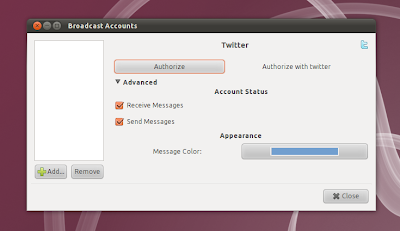 Today is Twitter's OAuthpocalypse: Twitter is shutting down basic authentification so all clients not using OAuth will stop working and one of these Twitter clients is Ubuntu's default microblogging client: Gwibber. That means that you need to upgrade if you want to continue using Gwibber. 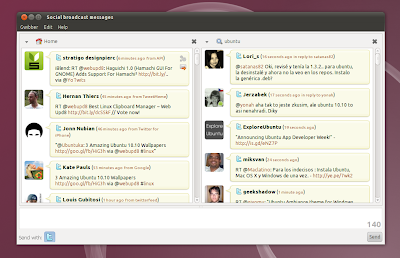 An official Gwibber PPA for both Ubuntu 10.04 Lucid Lynx and 10.10 Maverick Meerkat has been created - for testing purposes! - with an updated Gwibber version which uses OAuth. Note: Twitter will definitely stop working if you don't upgrade. This PPA is not a daily builds PPA! Yes, it's a testing PPA (they didn't mention this but probably these packages are going into the Ubuntu official repositories if the tests are successful) though. I can tell you that I've upgraded to the package in the PPA in Ubuntu 10.10 and everything is working fine. Tomorrow I'll also test it in Ubuntu 10.04.